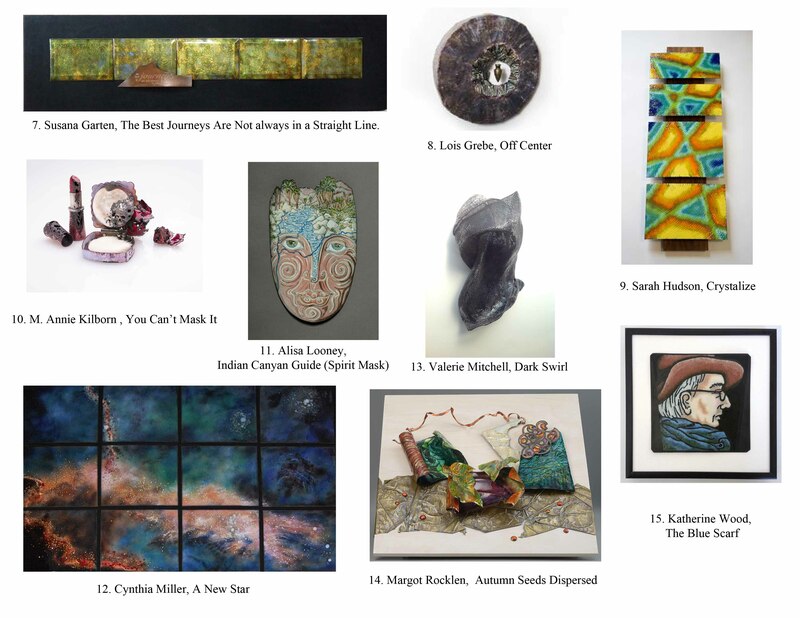 Networking – ADVOCATES FOR FINE ART ENAMELING INC.
Each season, AFFAE, Inc. will feature images from a contemporary artist whose work includes the medium of vitreous enamel to create expressive wall hangings and/or sculpture. 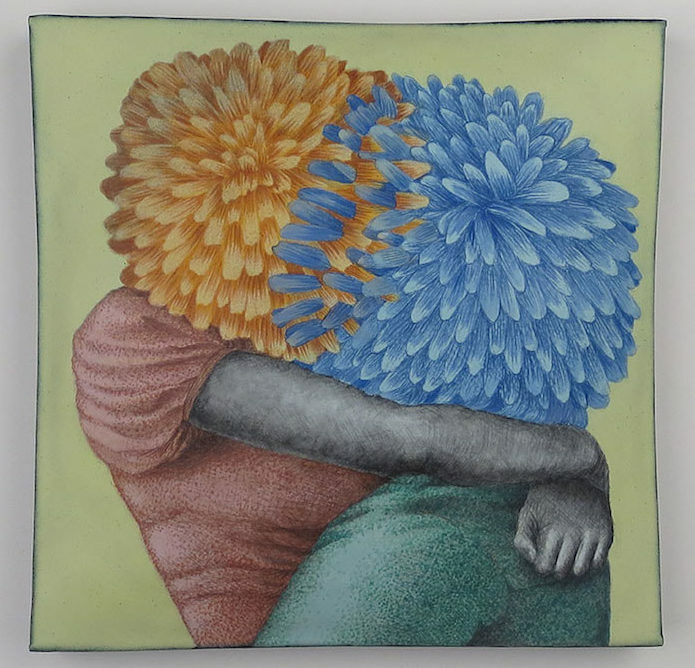 Artists who limit their creations to vitreous enamel are few, but some enamel crafters venture into expressive art, and some artists working primarily in other media at times fall captive to the charms of enamel, despite the challenge of the kiln. We appreciate that images never can capture the qualities of fired work completely, but we will do our best. Jessica Calderwood is very active now in the United States. She is a professor at Ball State University in Indiana. 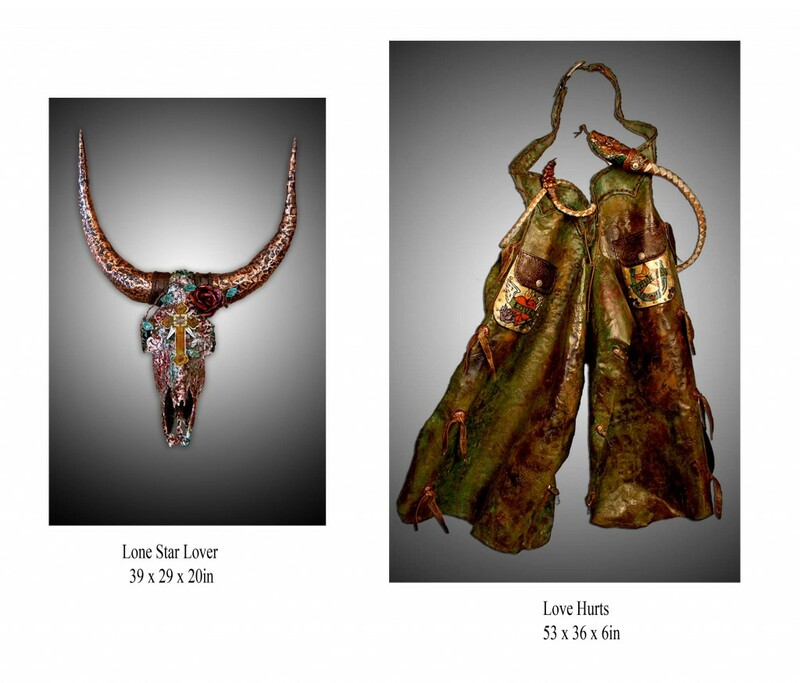 She uses a mixed media approach, with enamel, different metals, all sorts of industrial processing, and a wild imagination. 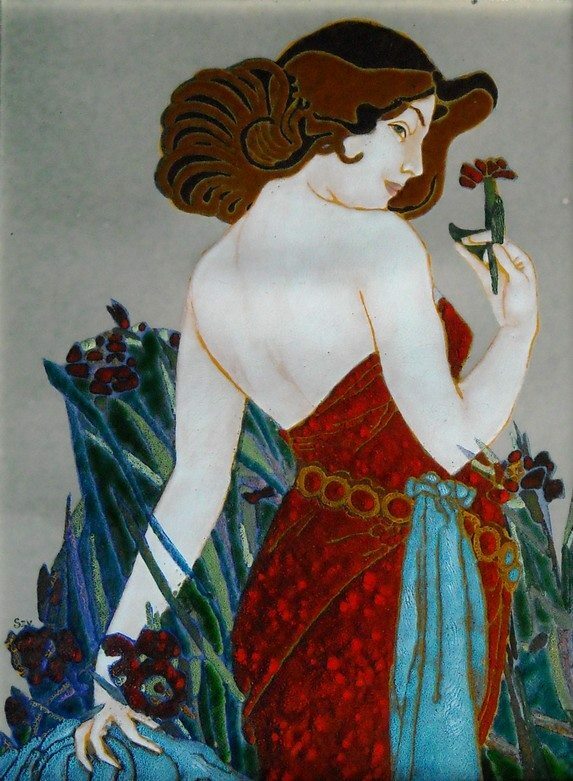 We will focus on her works which are mainly enamels. The Enamels above convey a quality of human emotions. The nature of the emotions is not explicitly depicted. Thus there is an atmosphere of mystery about these enamels. Here are two female figures hiding their faces, do they feel shame? Embarrassment? Are they duplicitous? What is happening in their lives? One is supporting the other. They are looking out at the world. Are they amused or frightened by what they see? 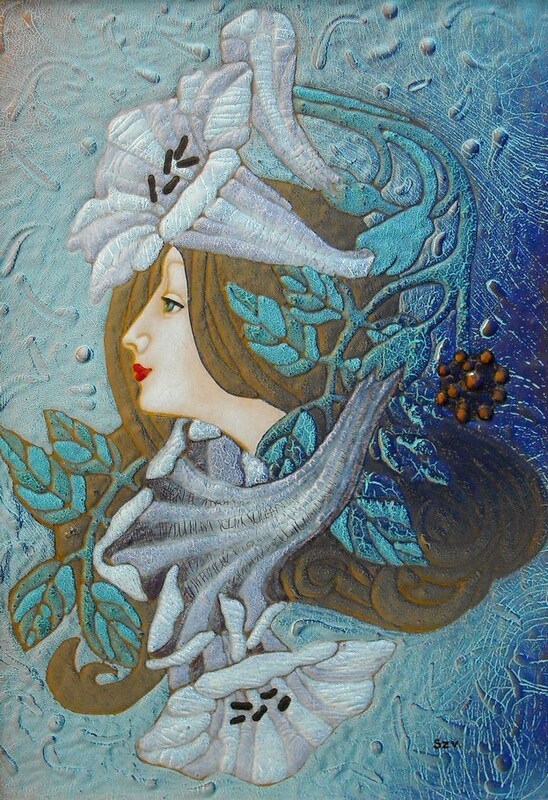 Szvetlana Toth is from Russia, but she has lived and worked in Hungary since 1991. She has studied art and has worked as a painter and an art restorer. She now enamels. Her location gives her access to a wide variety of brands of enamels. This piece was done with decals which Ms.Toth painted herself. The piece is 40X50Cm (15.5X19.5 inches). The work consists of three plates. The process work is conducted simultaneously on three plates. Kana Lomror was born in 1977 and grew up in the Sikar district of Rajasthan, India., This is an area famous for the vibrant colors of clothing and houses. He went to the University Rajasthan of Fine Arts in Jaipur in 1994 and he continued on to a master’s degree in fine arts from Visva Bharati University in West Bengal, one of the most famous centers in India. He was first interested in traditional murals but his attention shifted to enamel art. The endless possibilities for experimentation with enamels is a strong motivator for him. As with so many of us, he hopes to see vitreous enameling fully accepted as an art medium. 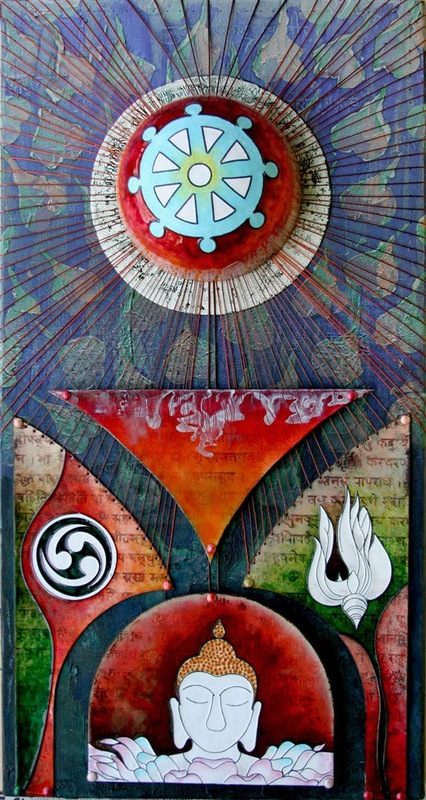 This is a rare fusion of painted canvas and vitreous enamel. Doors may be one of the most common objects in our lives. How many doors do people open and close during the day? Few doors are decorated so that there is anything noticeable about them. Doors decorated by, or fashioned from, vitreous enamel are rare period. Three such doors are described below. Kay Whitcomb did the 7 feet high double door. these two pieces were originally free-standing art but were later refashioned with added handles and hinges. They were probably never actually used as functional doors. 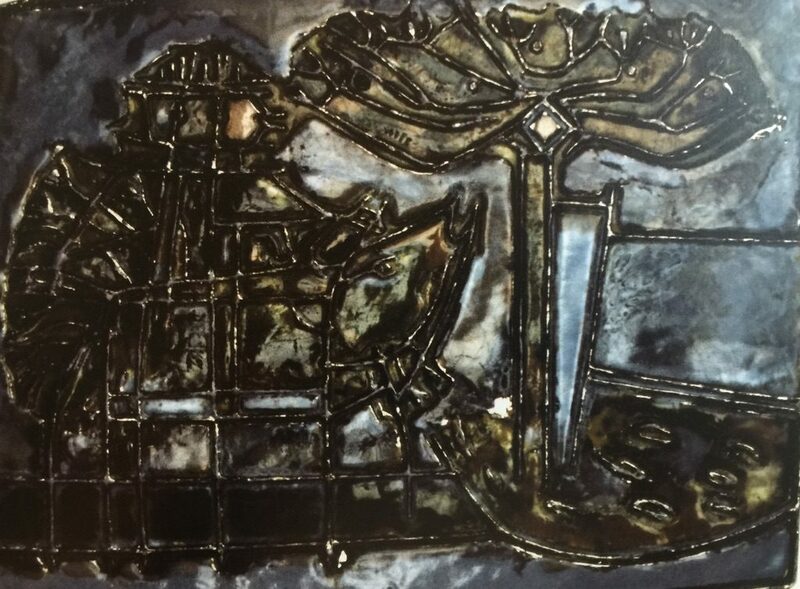 Enamel on steel, fired in Belgium. Napoleon Jones-Henderson was born in 1943 in Chicago, Illinois. Over the years, He is been particularly involved with African American art. 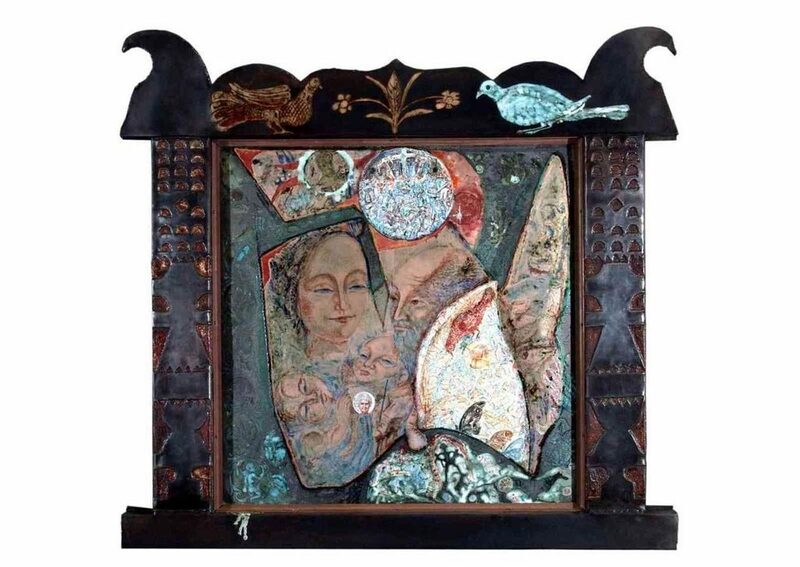 In recognition of his art, Jones-Henderson received the Merit of Honor Award from the Walters Art Museum and the Award for Outstanding Recognition from the Museum of Science and Industry. He was also honored by the National Conference of Artists with the Award of Excellence. Jones-Henderson created a set of double doors which are indeed functional. They are at the entrance to a collage library. Enamel doors can be quite heavy and might not easily be installed in domestic house. However, the door might be decorated with enamel panels. 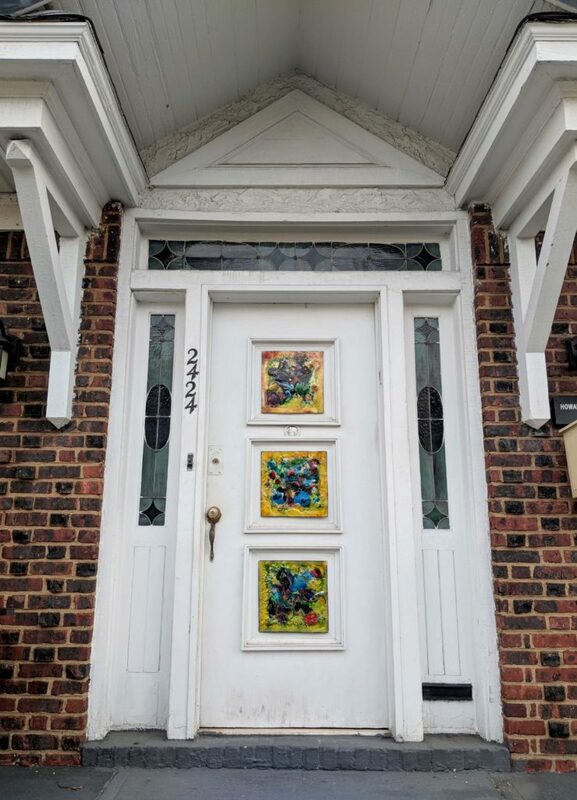 The front door of Howard Eisman house has three such decorative enamel panels. A very common exterior door has had three enamels fitted into the doors paneling. This is a good background for enamels. It has the advantage of not requiring any additional carpentry. 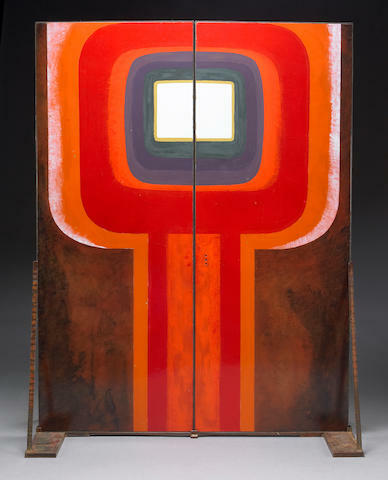 Enameled door panel by Indian artist Kana Lomror. 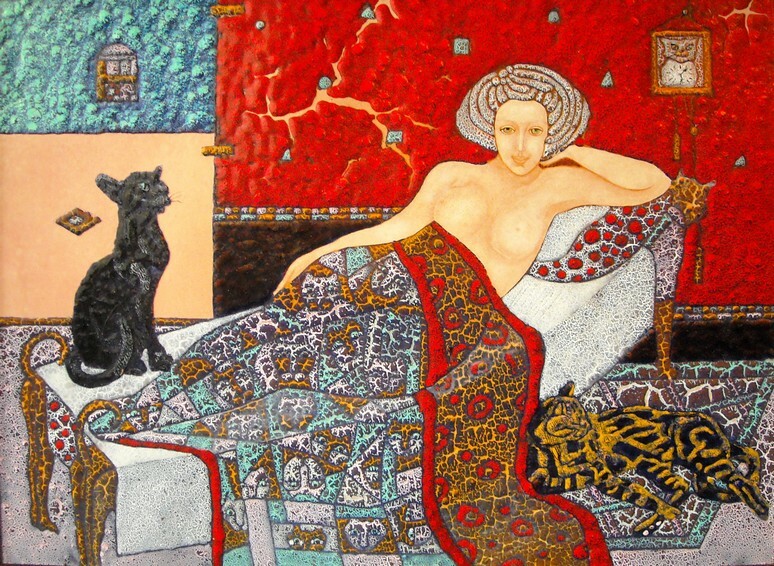 He is a European enamelist who has been using enamels for fine arts. He has been active in enameling close to 30 years. 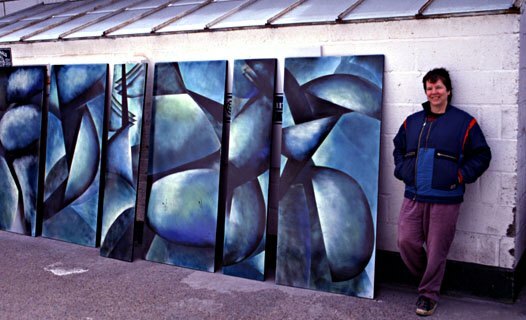 He has done enamels for both indoor and outdoor exhibitions and his enamels have been exhibited at public places. 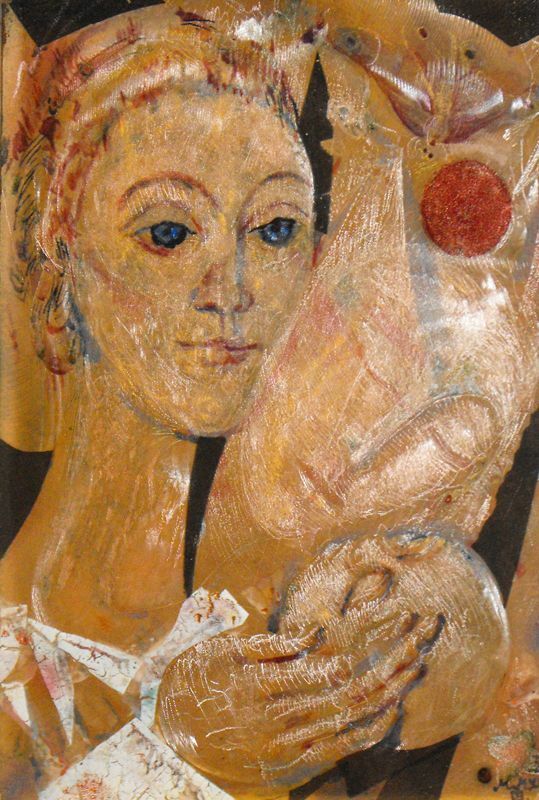 Turi Endre graduated from the Hungarian Academy of Fine Arts in 1959. 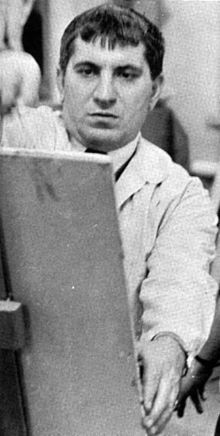 He moved to Kecskemét and he worked in Lampart’s Zománcipari Művek factory, This job acquainted him with the process of enameling. 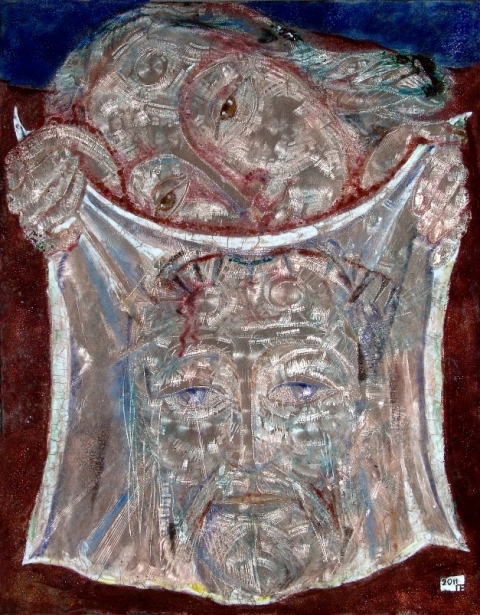 By the 1980s, he had developed his own unique style of using glass on metal. 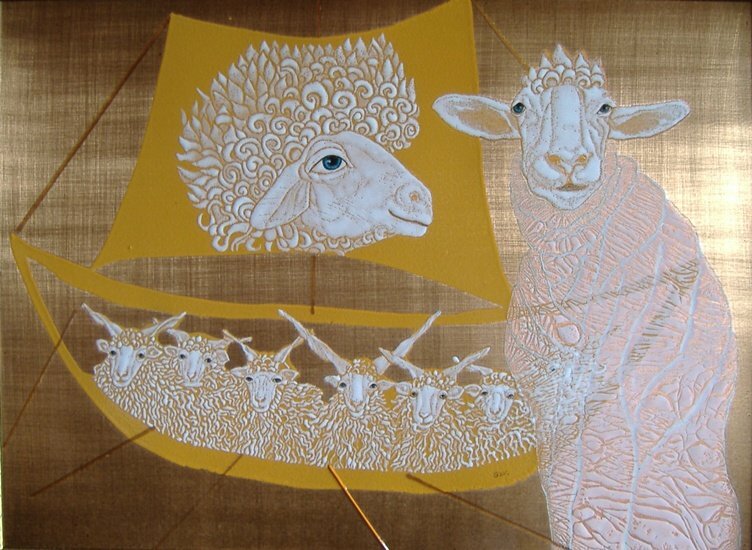 He has used Hungarian folk art as a frequent theme for his art. 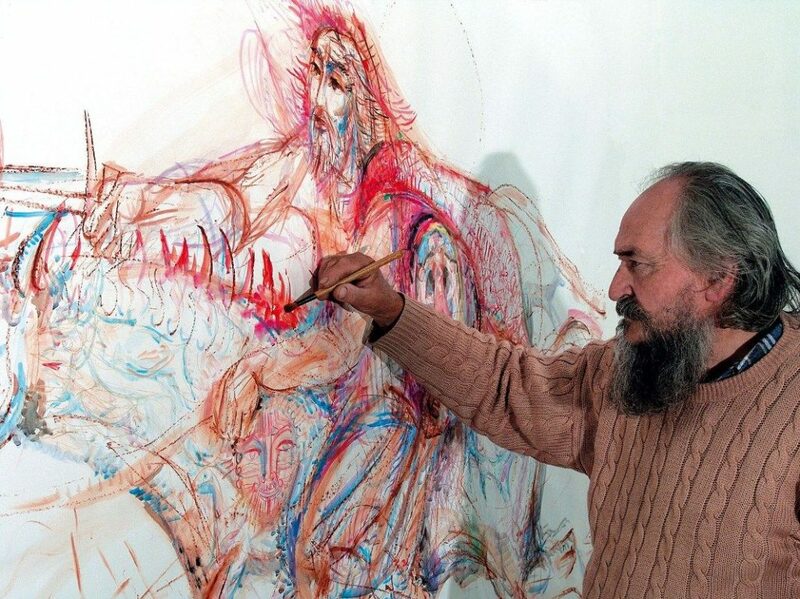 In 1984 he became the Director of the International Fine Arts Exhibition in Kecskemét. He was elected Vice President of the Hungarian Society of Fire Enthusiasts. From 1989 onwards, he taught at the College of Fine Arts in Bratislava for two years. He is an organizer and regular participant of the Kecskemét Fine Arts Exhibition. Virgil Cantini was born in Italy in 1919 and came to the United States with his family as a child. After serving in the Army in the Second World War he obtained a Master of Fine Arts from the University of Pittsburgh in 1946. 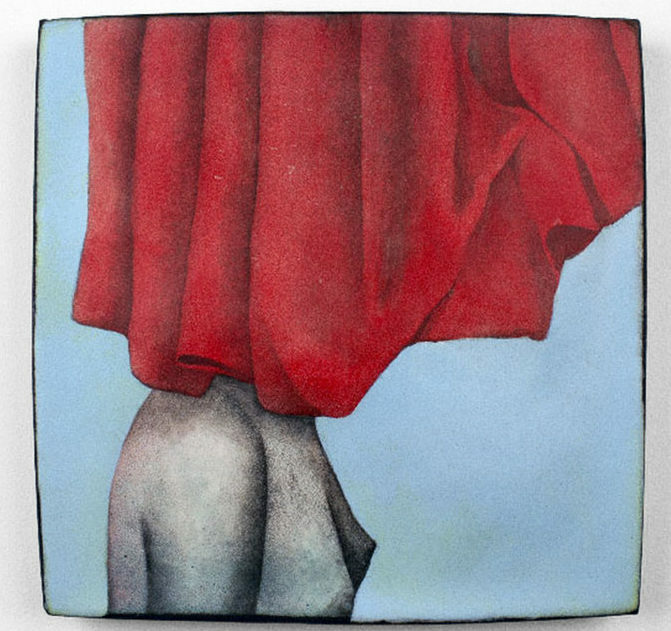 Two years later his enamel, “Masquerade” brought him national attention when it was included in the 13th National Ceramic Exhibition in Syracuse, New York. 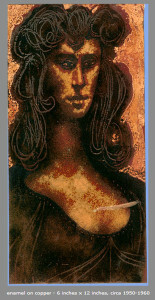 He would become one of the most well-known enamellists of the 20th century, with numerous public and private commissions. 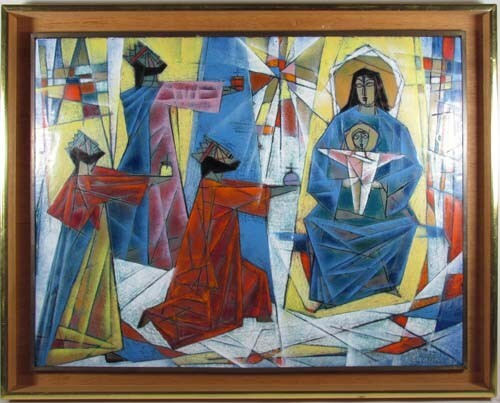 Raised Catholic, Cantini was drawn to religious subjects, and many of his early works have liturgical themes. 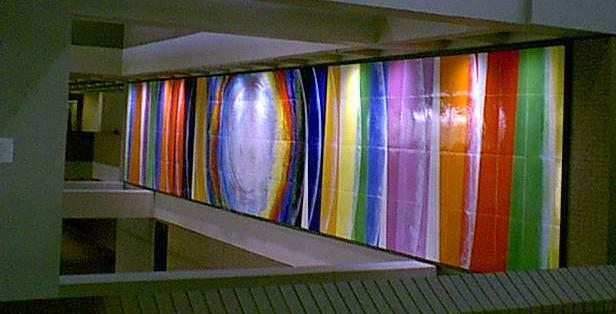 Durable and colorful, vitreous enamel was an ideal medium for large work in public places and examples of Cantini’s work, enamel and sculpture, can be seen around the city of Pittsburgh. 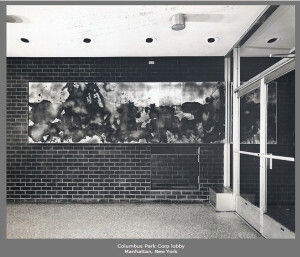 A number of his large enamels are visible in public spaces in Pittsburgh. Virgil Cantini died in 2009 at the age of 90. 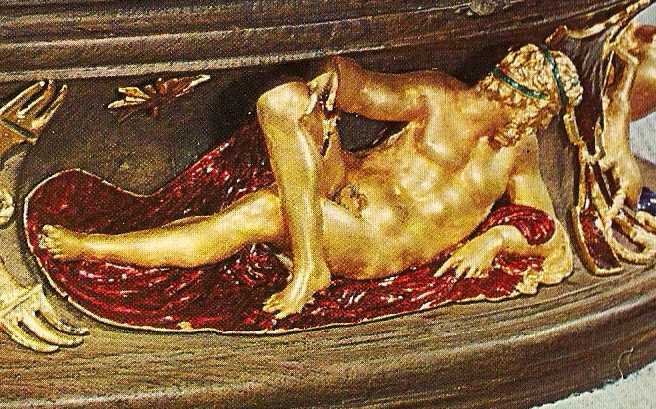 The first artist I knew anything about was Benvenuto Cellini. I learned about him while I was still in grade school. 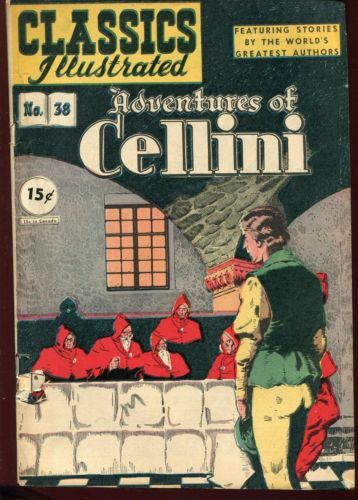 Classics Illustrated number 38 was a comic book version of his autobiography, The Adventures of Cellini. 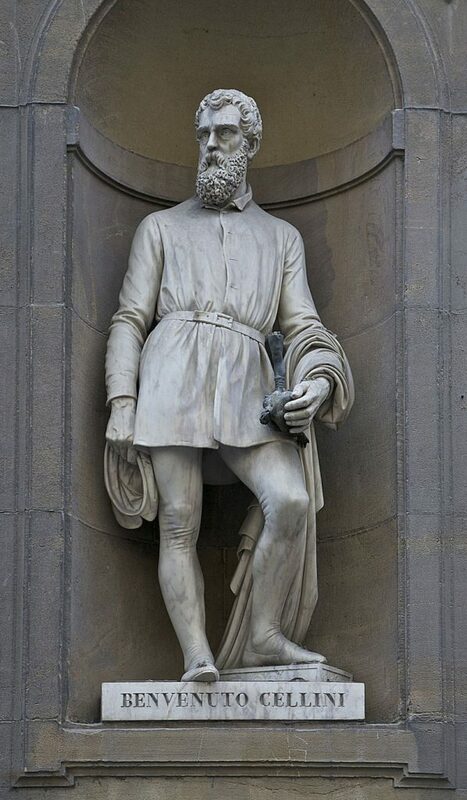 Thus, our enamellist of this month is Benvenuto Cellini. Unfortunately, he has only one recognized piece which can be unequivocally attributed to him, and the enamel on this piece is a secondary medium. 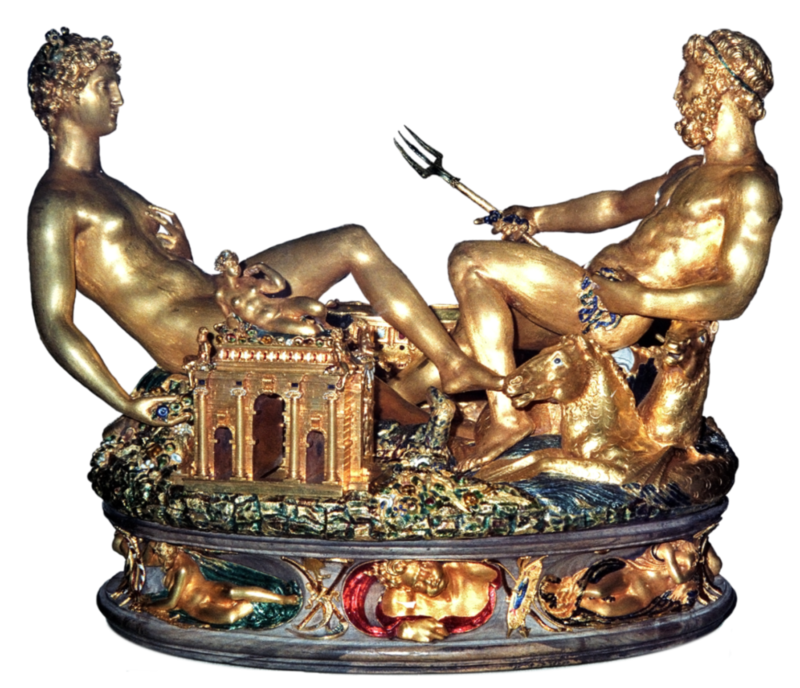 Yet this piece, the Cellini Salt Cellar, is well know and recognized as a masterpiece. It was stolen some years back and this theft made international headlines, as did its subsequent return. The 1947 classic illustrated version of Cellini’s autobiography. 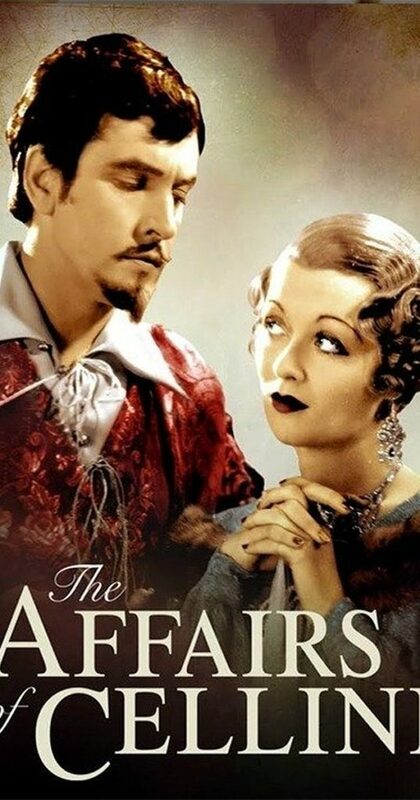 Frederic March as Cellini in a 1934 romantic comedy. Historians have been quite skeptical about Cellini’s claimed adventures. Too many duels, too many bedrooms, too many irate husbands, too many satisfied royal patrons, and too many lost masterpieces. So what! Let’s accept him as a character and a very superior self promoter and enjoy his masterpiece and his great stories. 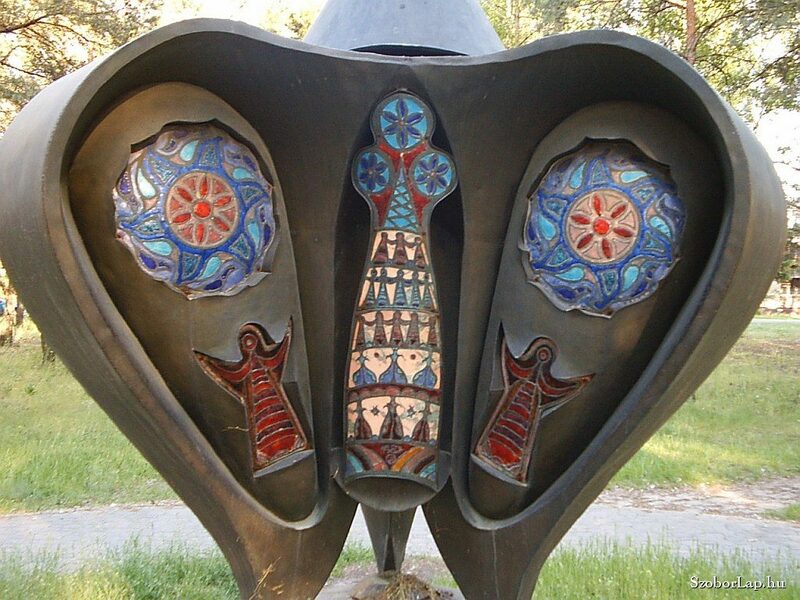 Salt cellar detail showing the complex metalwork and the use of vitreous enamel. Salt Cellar detail showing the use of vitreous enamel. Stefan Knapp was an enamelist who led an adventurous life. His enamels could reach incredible sizes, and he developed unique enameling techniques to allow him to make such large enamels. Knapp was a young man in Poland when the second World War broke out. He was an officer in the Polish military and was captured by the Soviets and placed in a concentration camp. When Germany attacked the Soviet Union, Knapp was allowed to leave and make his way through Asia to British territory. 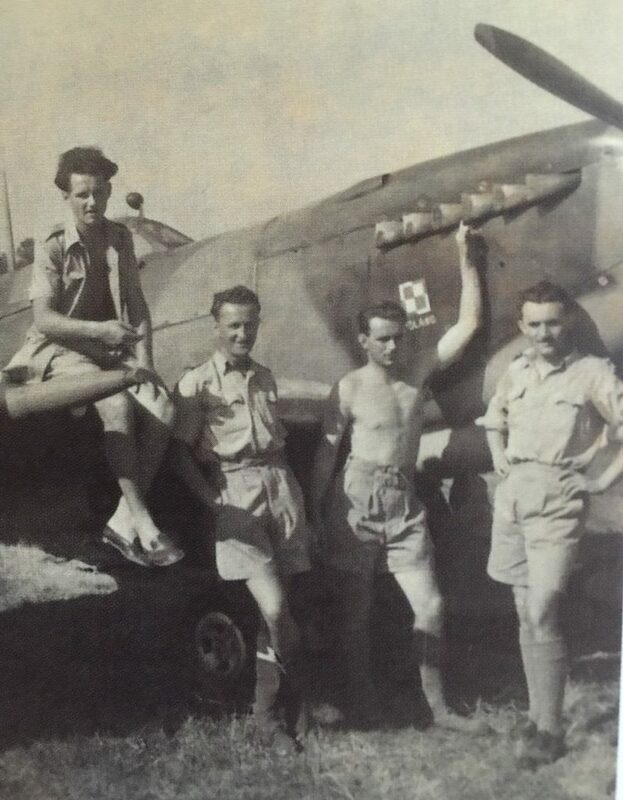 He became a fighter pilot in the Royal Air Force and flew the legendary Spitfire. He was impressed with the sight of agricultural fields whizzing by under his Spitfire. 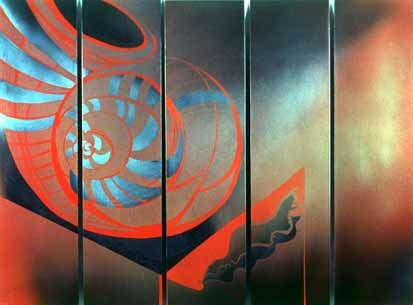 These images later became the themes for some of his abstract enamels. After his war service, Knapp remained in England and became an artist. 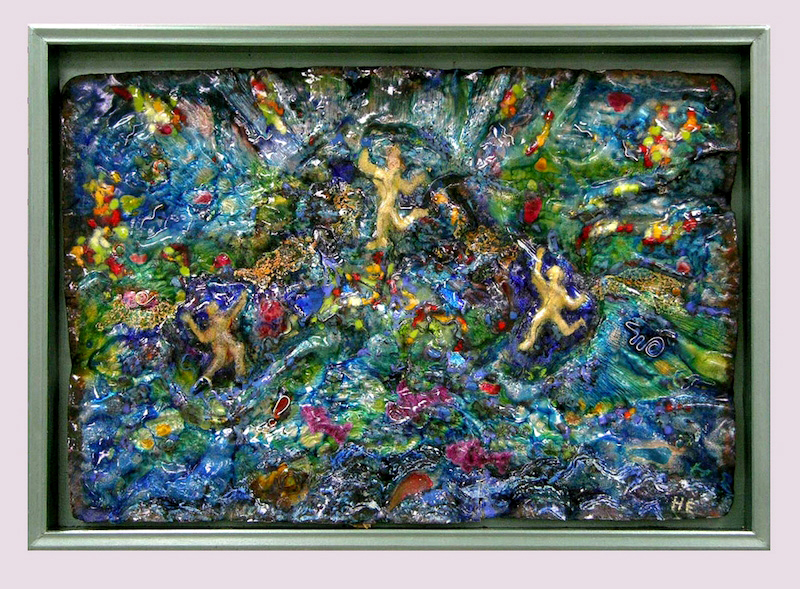 His experimentation included glass-on-metal art. He liked the results. 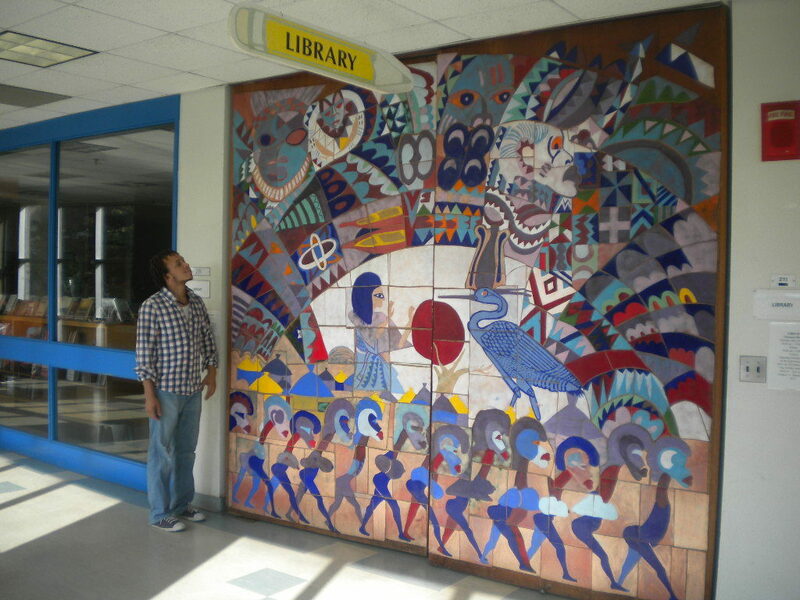 Large mosaic on display at Nicolaus Copernicus University in Toruń, Poland. 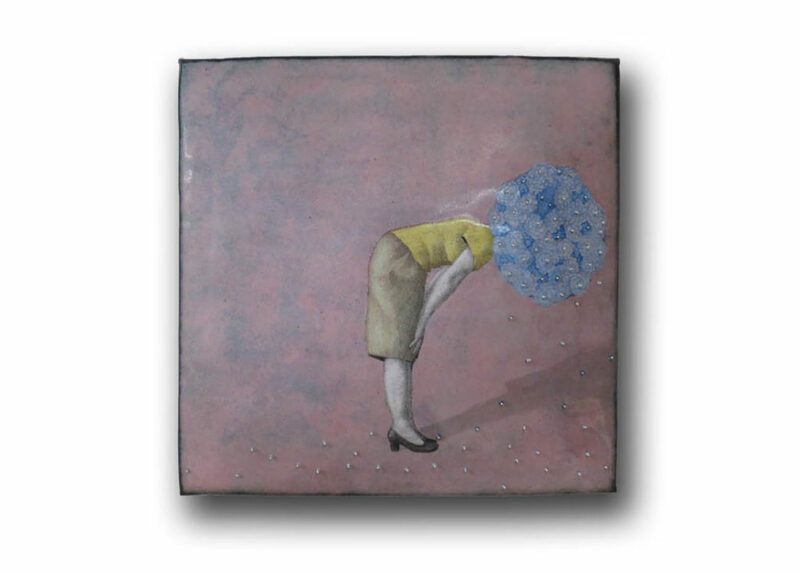 Enamel on steel. 1972. 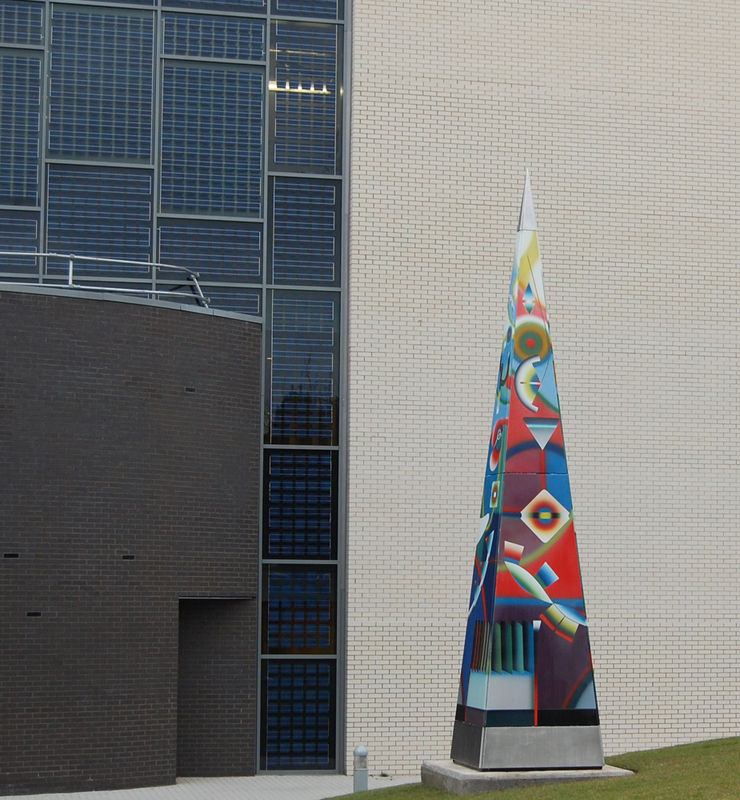 1,600 square ft.
Needle of Knowledge Obelisk on display at University of Warwick. 1993. Enamel on steel and stainless steel. 11 ft x 4 ft x 4 ft. 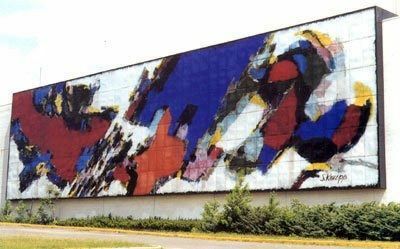 In 1960, Knapp was commissioned by George Farkas to do an abstract enamel covering the entire wall of an Alexander’s Department Store building in Paramus, New Jersey. The commission also included smaller enamels for multiple Alexander’s locations. The enamel (below) was 200 feet long by 50 feet high and weighed 250 tons. 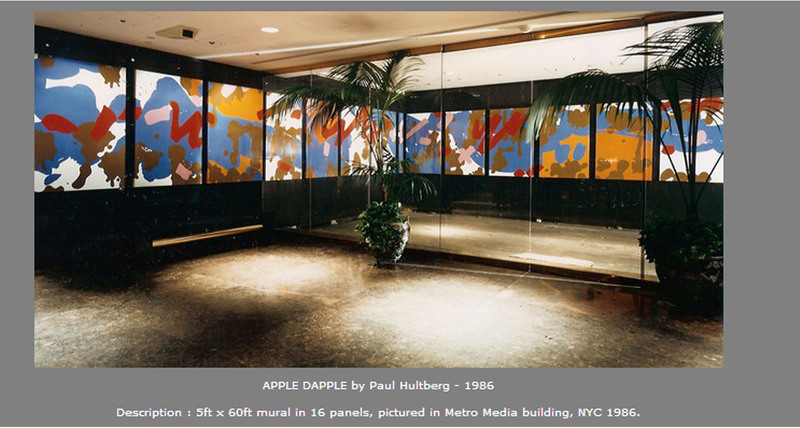 Knapp laid the enamels on the floor of a very large building and applied liquid enamel with mop-like brushes. He walked on the enamel panels wearing specially designed skis. 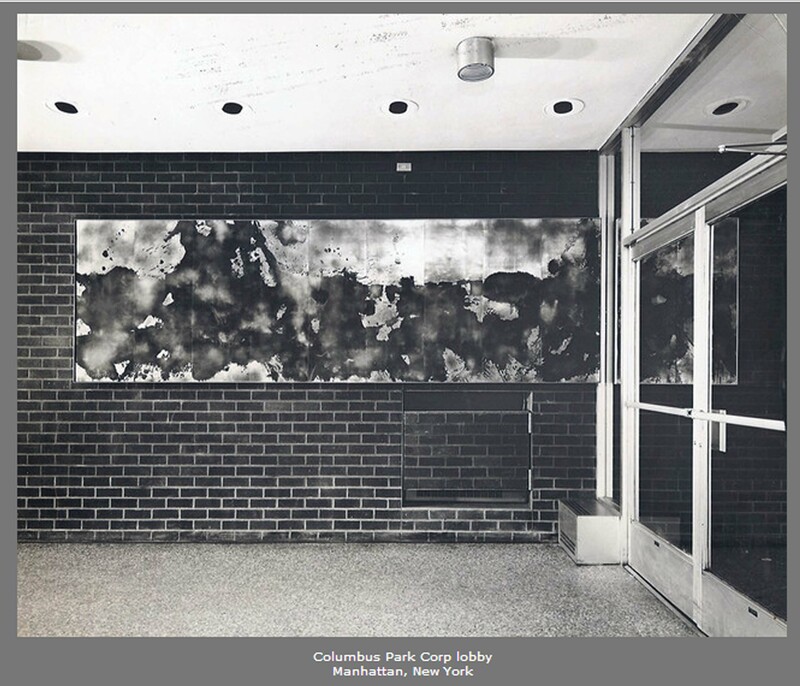 The panels were made of steel and the abstract designs reflecting images that had remained in Knapp’s memory from his days as a fighter pilot. Some of the people viewing the enamel were on a nearby elevated expressway and their impression of his image would be similar to what he first saw in his plane as they drove by. Alexander’s Mural. 1961. 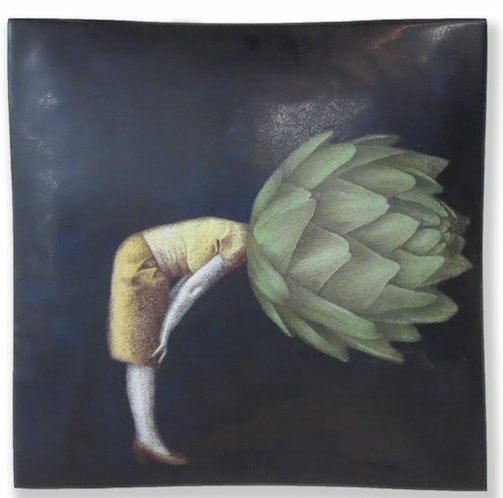 Enamel on steel. 50 ft x 200 ft. Originally on display at Alexander’s Department Store in Paramus, New Jersey. The Alexander’s building has been torn down. However the enamel was rescued, and it is now owned by the Bergen Museum of Art and Science in Paterson, New Jersey. Pat Johnson lives and works in London, UK. She works on copper and steel panels. 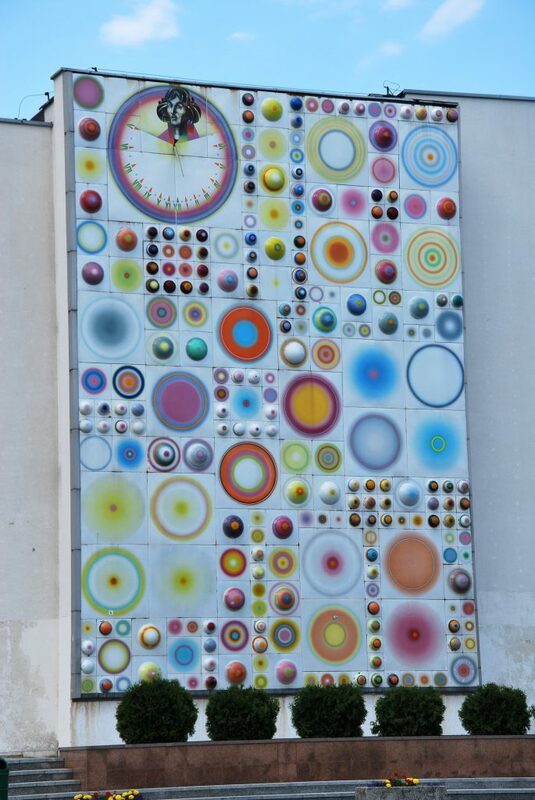 She has done some very large enamels on steel panels for outdoor display. Her displays have been installed in parks and on two cruise ships. Her colorful enamels stand out in the North Atlantic climate of cloudy skies and drizzly days. Pat Johnson’s enamels at the Chelsea Flower Show. 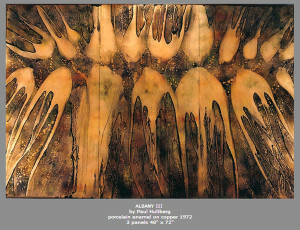 We are emphasizing her work on steel panels since this is her prominent contribution to the use of enamel in Fine Arts. Her panels are quite large and a series of adjacent panels makes quite a display of the medium. She works on these steel panels with a spray gun to apply industrial liquid enamel as well as jewelry enamel which is sifted on. She fires her enamels at an industrial plant, Burnham Signs, which has made it’s kiln facilities available to her. 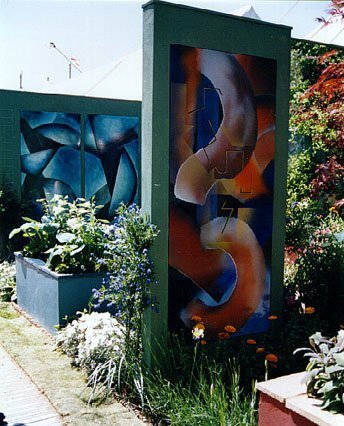 Here are two sets of large steel panels which were displayed at the Chelsea Flower Show. The large scale of Pat’s steel panels can be seen here. 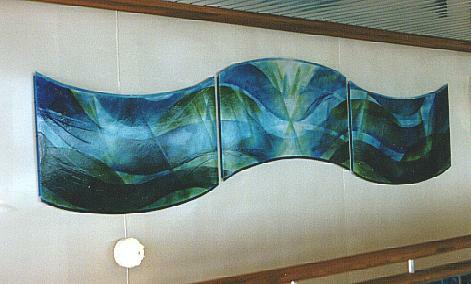 This abstract seascape in a wave shape was installed on a cruise ship. 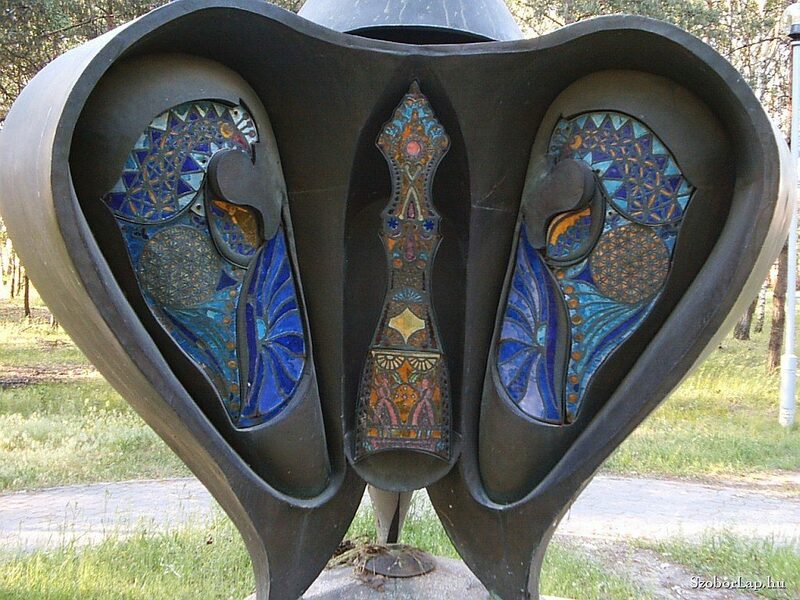 “Snail Shell” enamel on steel 47 x 63 inches. 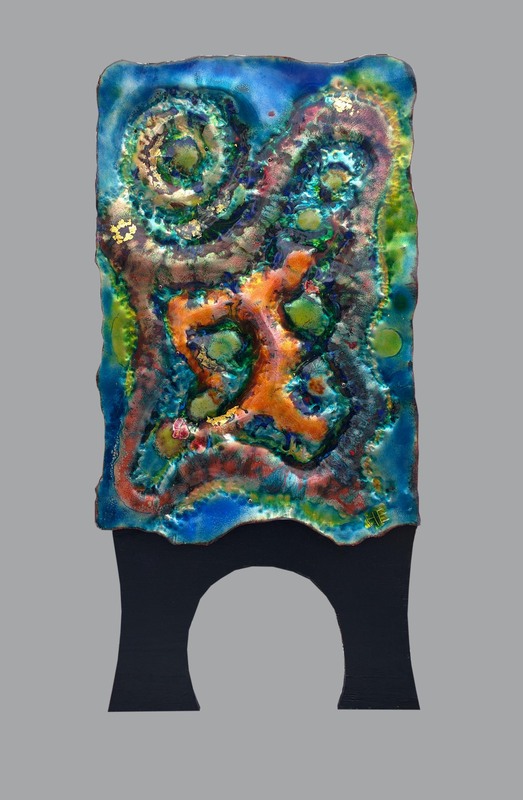 “Abstract” jewelry enamel on steel 30 x 42 inches. 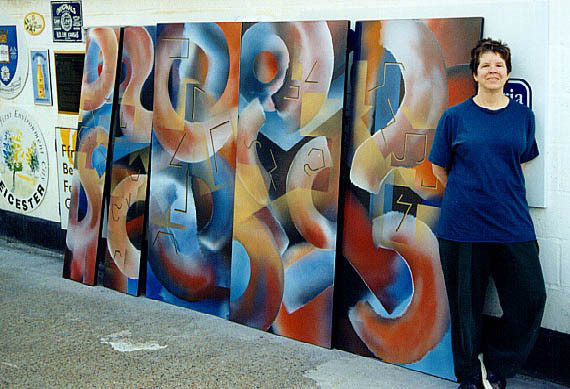 Howard Eisman has said that his art is designed to convey the message that life can be a colorful adventure. 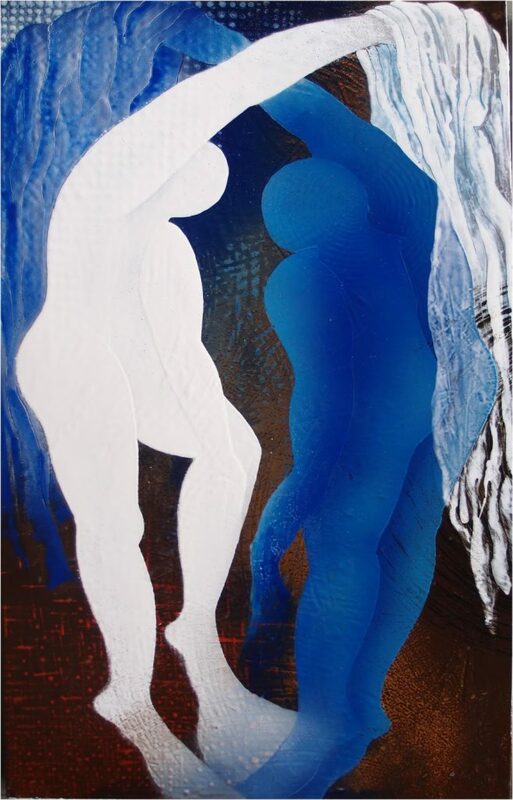 Thus, he tries to emphasize color and the illusion of movement in both his figurative and abstract art. 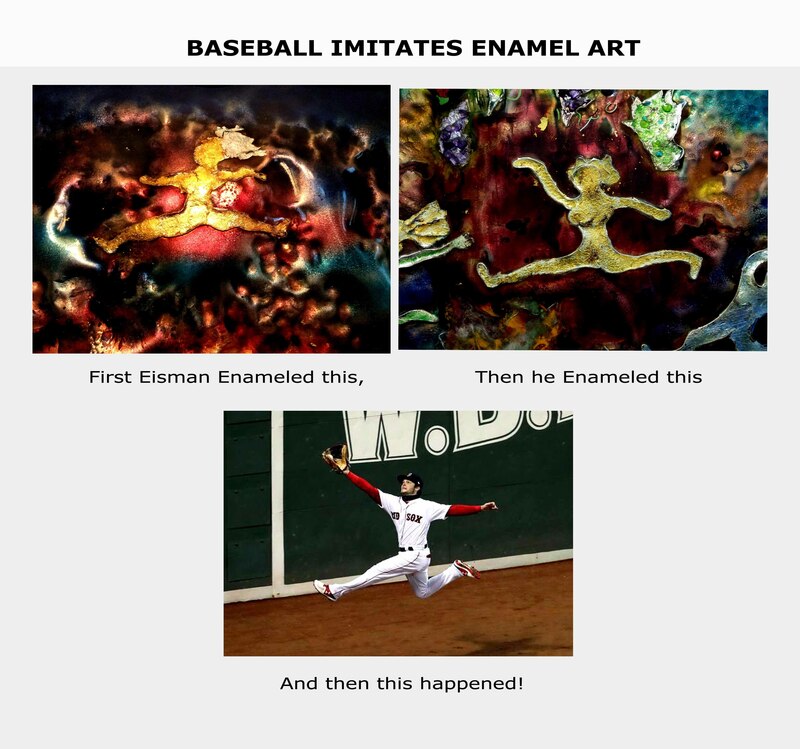 “Double play” is a baseball term for an event that consists of swift movement and acrobatic skill performed before a shouting crowd of enthusiastic spectators. 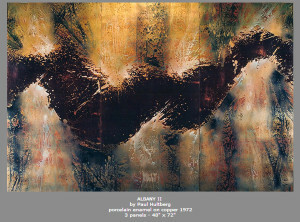 In his enamel on copper piece, “Double Play”, (25″ x 37″). Eisman tries to capture his moment of excitement. This enamel is in the W.W Carpenter Enamel Foundation Art Museum in Bellevue, Kentucky. 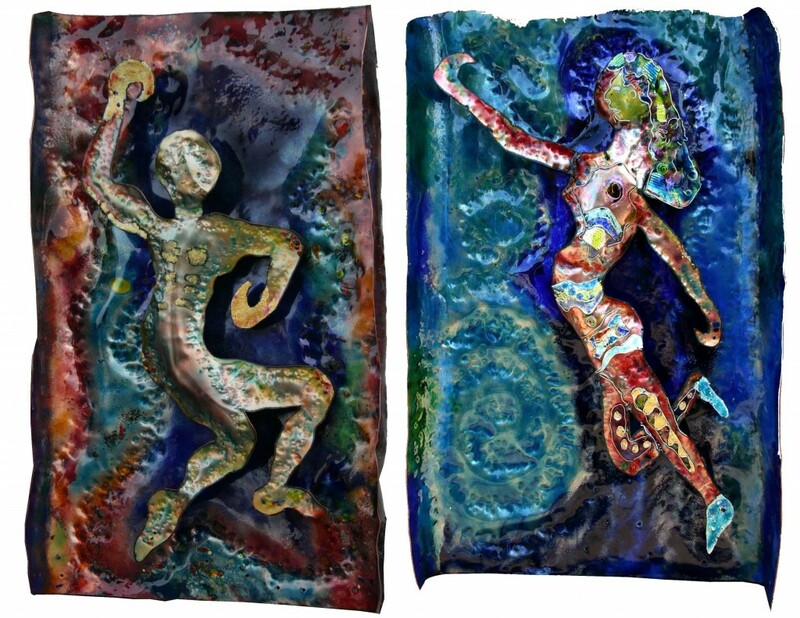 The companion pieces, “Orpheus” and “Eurydice” are both 36″ x 22″, enamel on copper three dimension sculptures. They are meant to be displayed on a pedestal. The figures, which protrude from their background, are portrayed as heroic and mythical. The background colors are meant to further define the nature of their personalities. “Stride” (36” x 25” ) is a free standing sculpture installed in a garden. 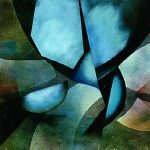 It is an abstraction which conveys the sense of incisive and spirited, self assured movement. It is made with enamel on cut, shaped, and hammered copper. The base of the enamel is painted wood. 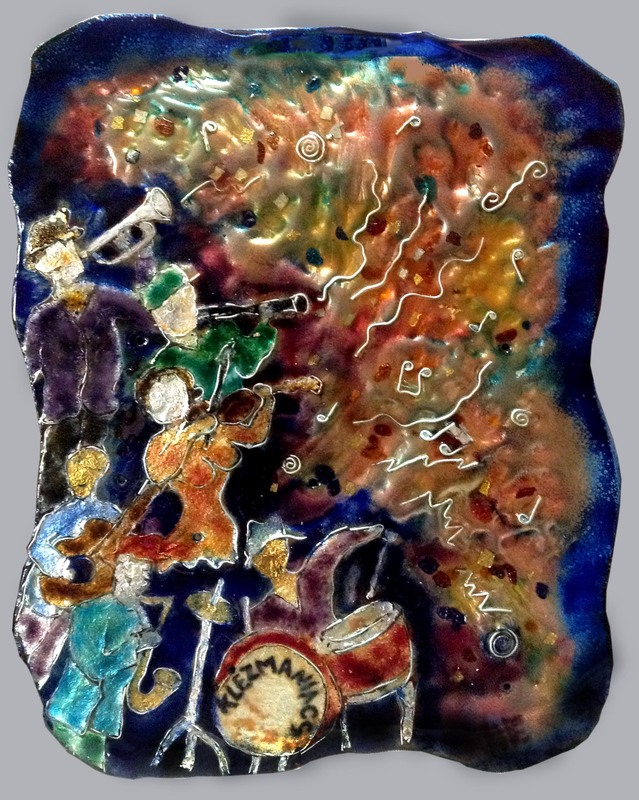 “The Klezmaniacs” (16.5” X 12”) enamel on copper and silver, conveys that rampant energy and wild music of a Klezmer band. Their lively, festive music is represented by the texture of the background, the colors and silver wire symbols on the copper to their left. Howard Eisman fondly remembers Bill Helwig, who was such a great help to him. 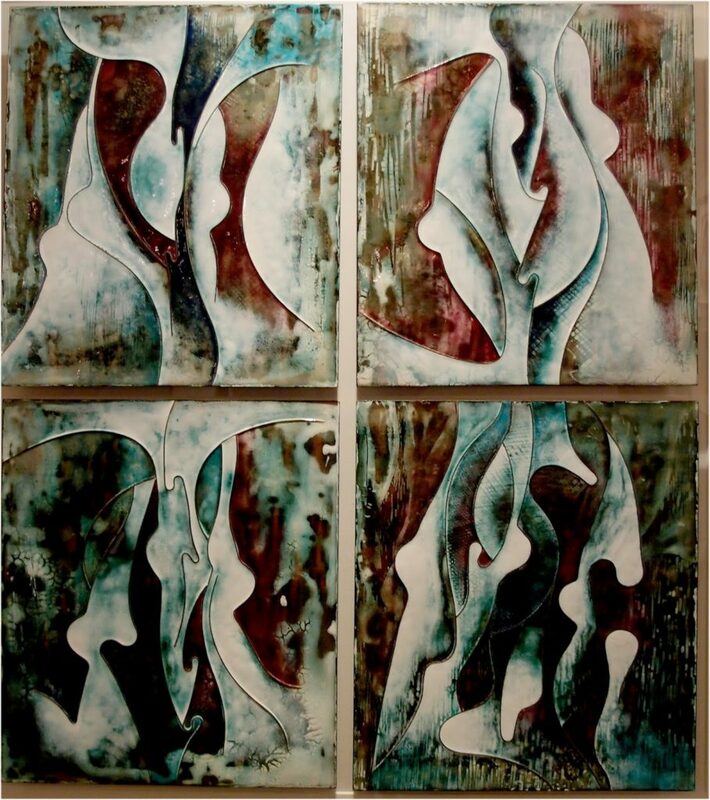 Delia Dante is an internationally recognized metal and enamel artist who works in Boise, Idaho, where she has a studio and a gallery. One of her pieces, Me Deuce, below, is in a Boise restaurant. While beautiful, it also may create a somewhat intimidating air. 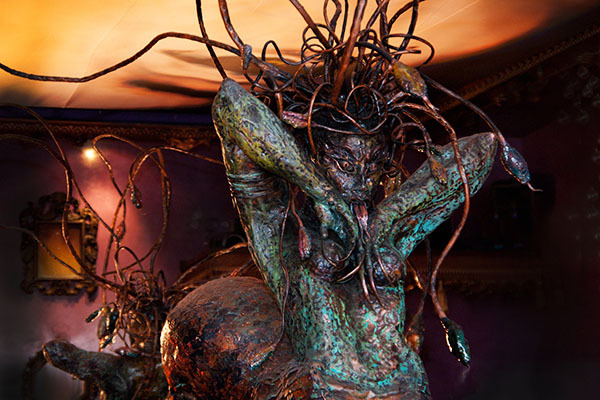 The theme is the mythological Medusa. 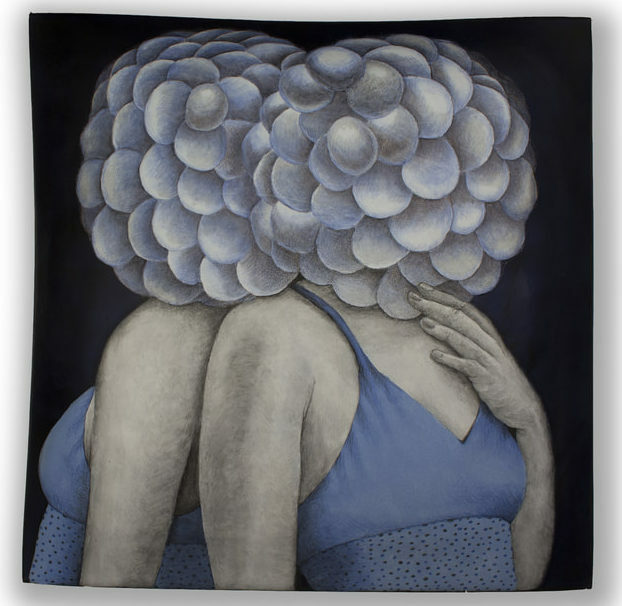 Dante sometimes likes to play with themes that express the mythology of her geographic location, growing up in San Francisco and settling in Boise, Idaho. 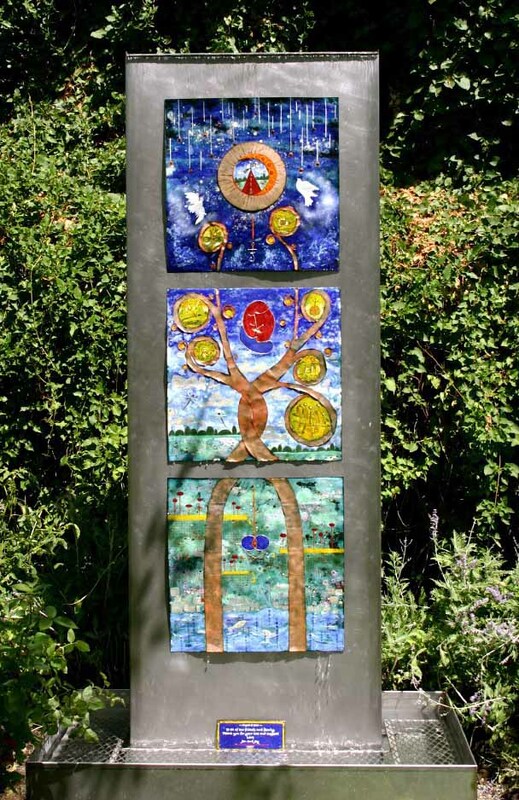 Of particular interest in enameling, Dante creates art for the outdoors as well as for the interior. 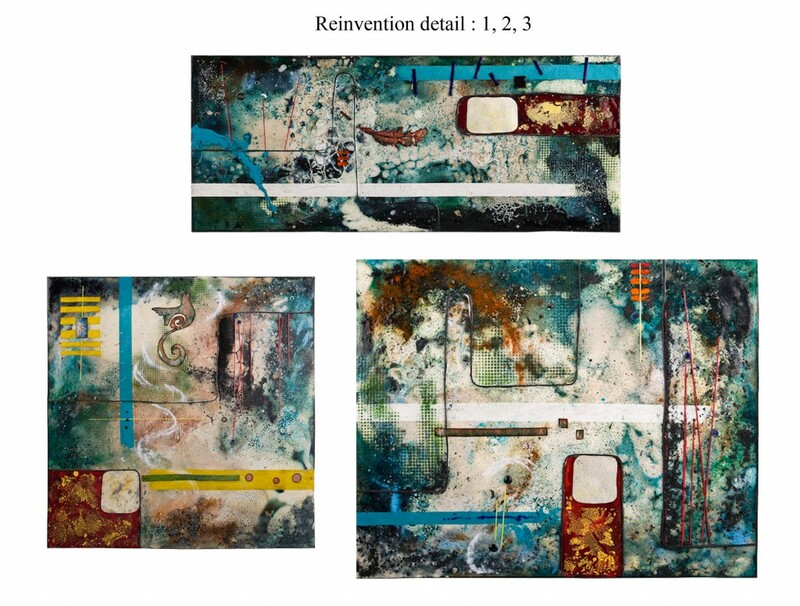 Here are three enameled variations on an abstract theme mounted on a rustic stone wall. 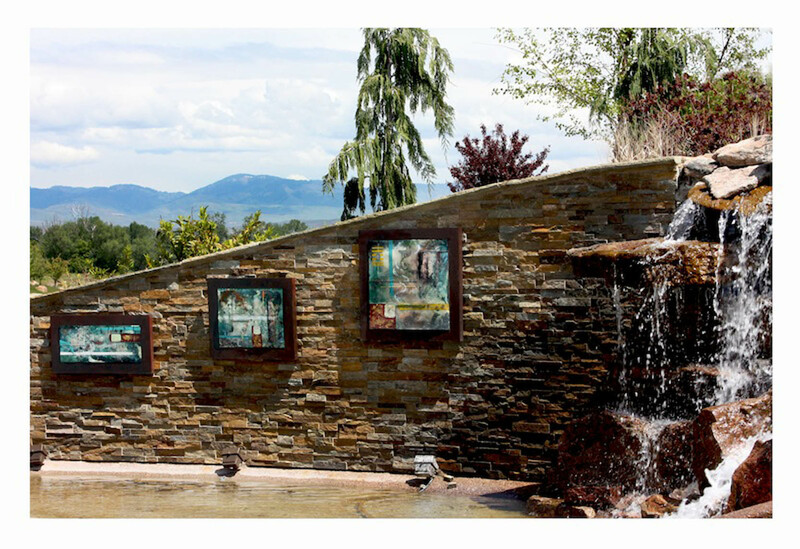 Here is Unity Fountain, a sculptural waterfall which provides a center to a lovely garden. 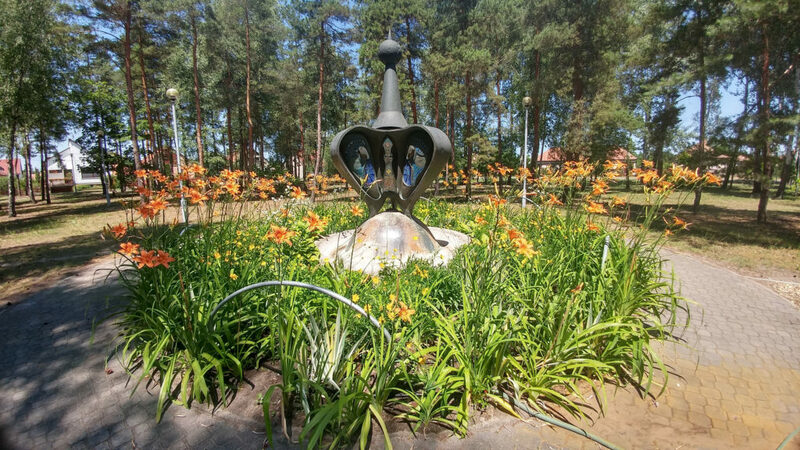 This fountain symbolizes eternal love with two trees intertwined in union, ascending from the earth in springtime through the sky into the heavens. 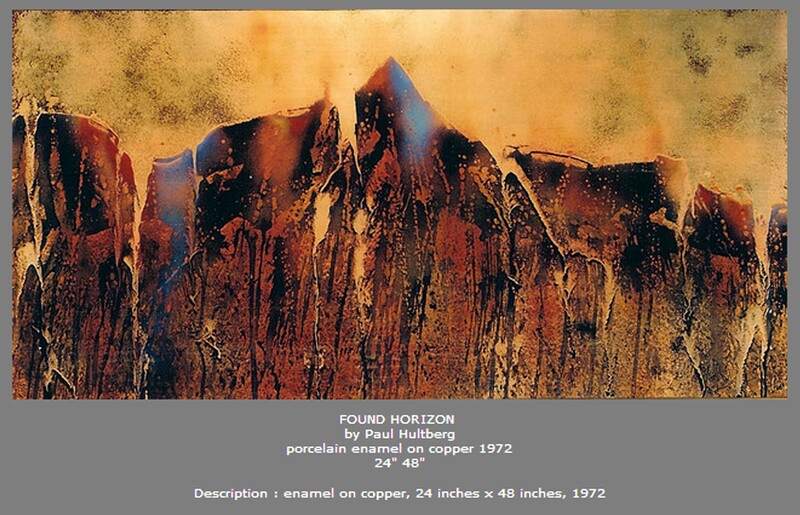 Paul Hultberg, our featured artist, created enamels which are examples of how enamel can be used to make outdoor, large murals. 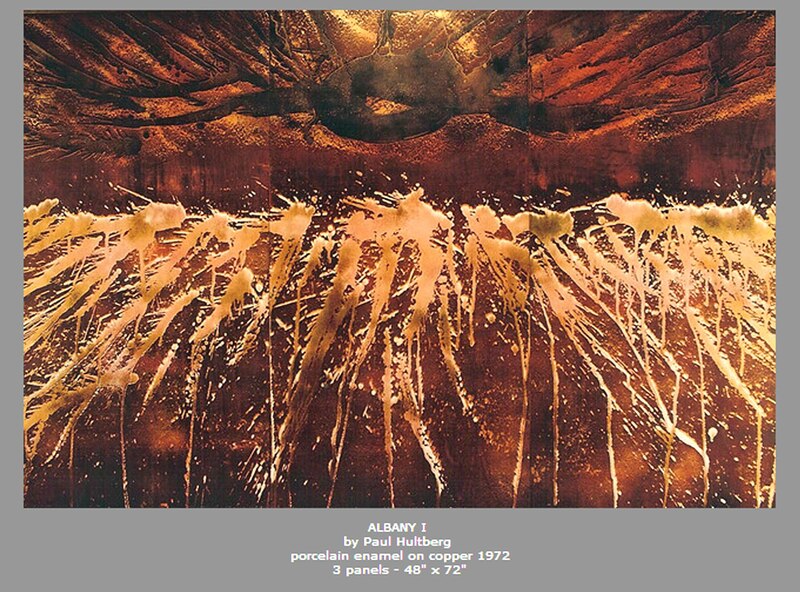 His work also is also a demonstration of the manner in which enamel can be used in abstract expressionist art. Hultberg was born 1926 in Oakland. He took some classes at Fresno State College and the University of Southern California in Los Angeles. He later developed a strong interest in mural painting. He eventually started his own mural painting business in the 1940’s. 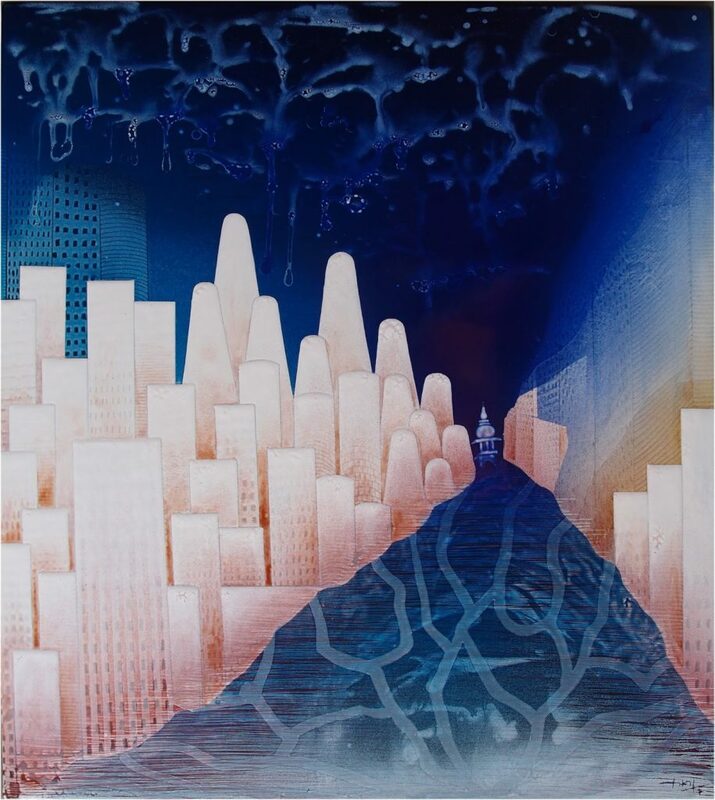 He continually experimented with various media to incorporate in his large mural works. 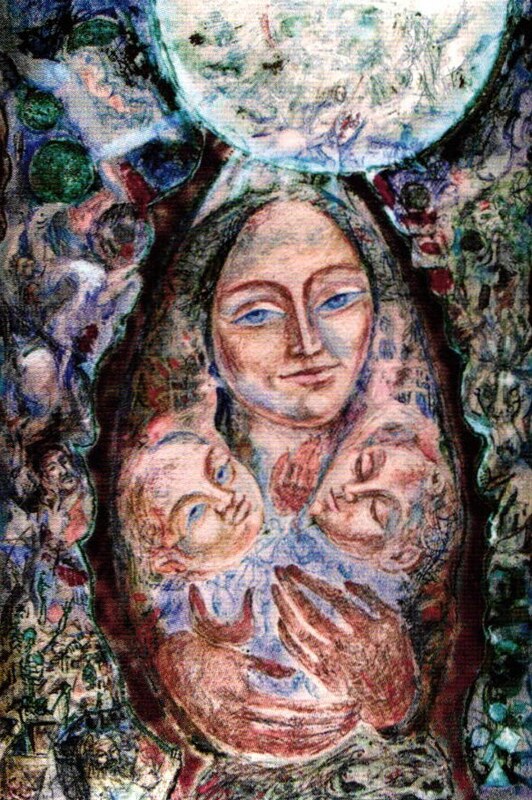 In the early 1950’s he taught painting and drawing at the Brooklyn Museum Art School. There he met Walter Rogalski, a printmaker. 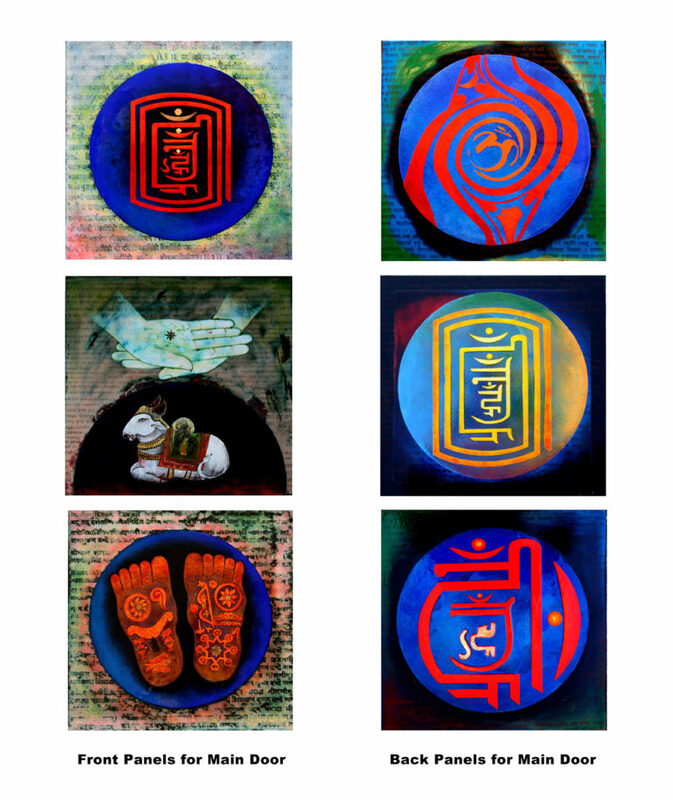 For a year together they experimented, on combining painting and printmaking techniques with enamels. 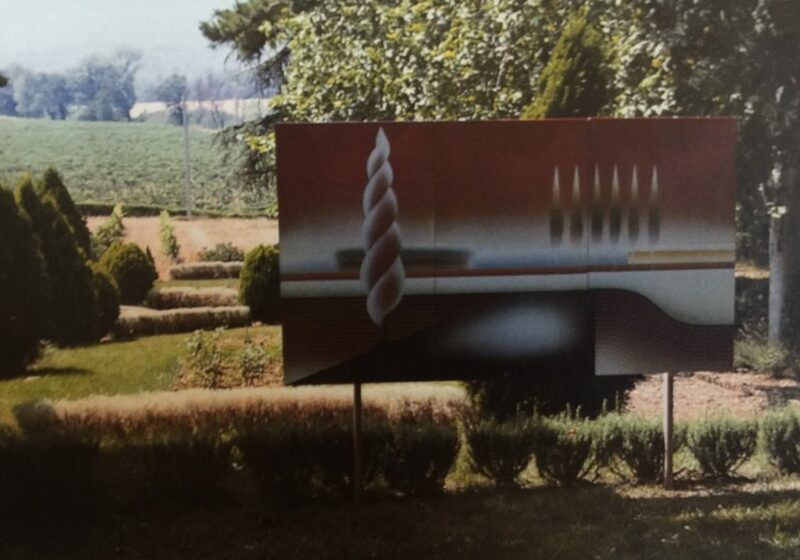 At first, it was small scale, but Hultberg later developed them into his murals. His enamels have been featured in museums such as the Museum of Contemporary Crafts in New York. He’s received numerous architectural commissions, including one for the Pan Am Building in New York. Please note : AFFAE DOES NOT RECOMMEND FIRING ANY ENAMELS IN THE MANNER PRESENTED ABOVE. It is very dangerous : it could start a fire or an explosion. In addition, such a firing method reduces control of the enamel image, and it may limit the durability and stability of the fired enamel. 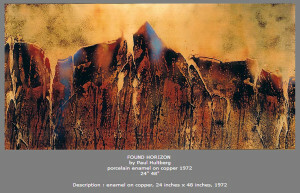 Below are some enamel art works done by Hultberg. Please click on the images to enlarge, and for details on the pieces. To begin 2016 on a note of innovation, our recognition in January will not be for a single individual enamel artist, but for the Enamel Guild NorthEast (EGNE) and particularly their Exhibition Committee. At the end of 2015, EGNE mounted an exhibition ONLINE only. 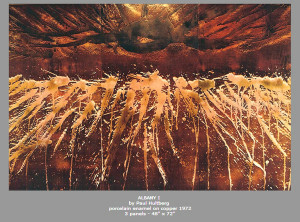 For the show, called “Under Fire,” pieces were selected for inclusion based strictly on online images, rather risky because it is so difficult to capture enamel surfaces. The intrepid curator, Barbara Seidenath is a metalsmith/enamelist who teaches at Rhode Island School of Design. 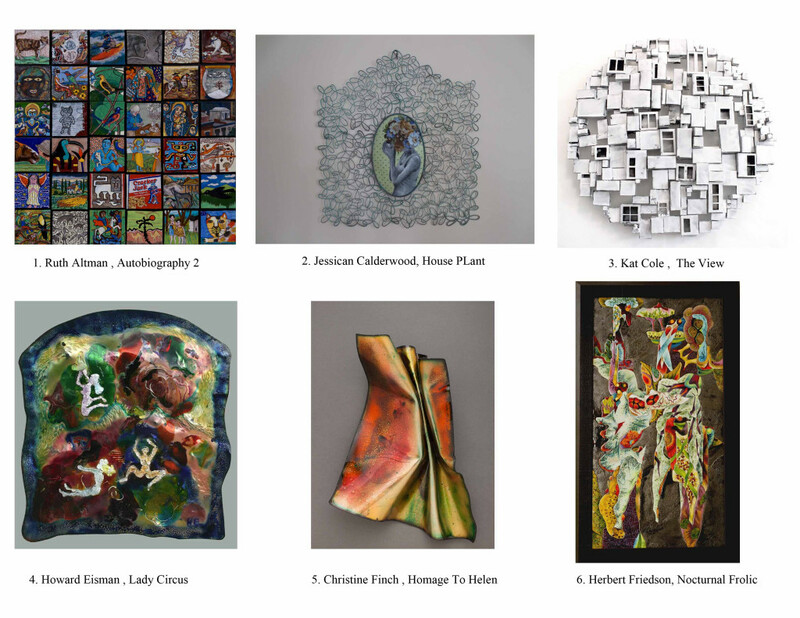 Her selections are inclusive: “The works range from traditional designs and techniques to thoughtful explorations of form, as well as the experimental use of enamel, all reflecting the diverse ways this medium can be interpreted and applied.” Submissions to “Under Fire” came from 20 U. S. states and 4 other countries. 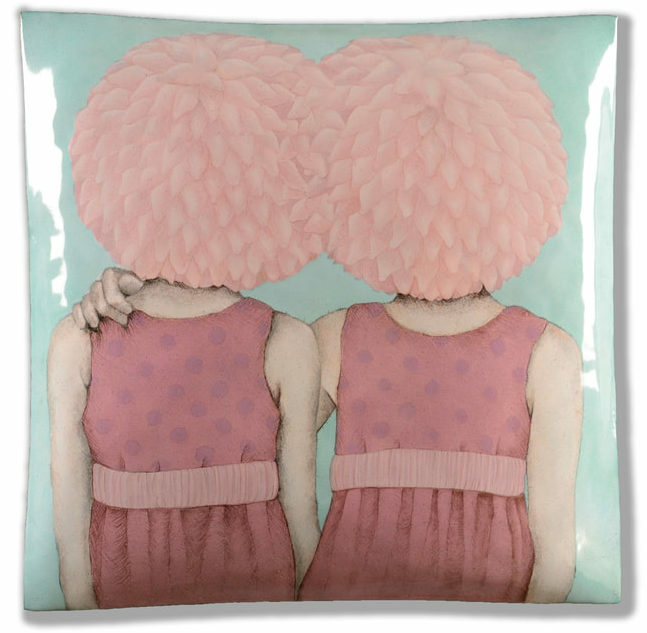 Most of the works are categorized as jewelry and vessels, with 15 pieces of wall art or sculpture. The 15 works are shown below with the artists’ names arranged alphabetically. Kudos to Enamel Guild North East for this innovation. Opening of the Enamelist Society Exhibition at the Gallery of the League of New Hampshire Craftsmen, 1/15/2016. Kudos to the League of New Hampshire Craftsmen! On Friday evening, My wife was blown away by the overall impression of creativity and color at their opening of the Enamelist Society exhibition at the League’s gallery in Concord, N.H. The venue is considerably more attractive than typical bare rectangular spaces within which enamel art and craft often is displayed. The League has occupied their current location for about three and a half years, and the gallery space has been designed specifically to accommodate art and craft exhibits, with matte black 10-foot ceiling, many great high windows, and movable walls that provide for interesting reconfigurations of the interior space. Catherine Green and her Gallery Committee set up the exhibit to show each piece to advantage and create a breathtaking display. 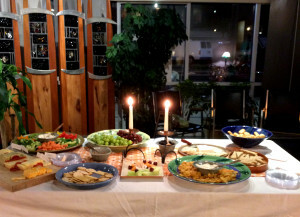 In deference to the artists, no photographing was done in the main gallery, but attached are images of the gracious refreshment table and the display in the adjacent Grodin Museum of selected pieces from the League’s permanent collection. A steady stream of visitors enjoyed the exhibit, welcomed by knowledgeable volunteers who offered information and conversation about the exhibition and the gallery. 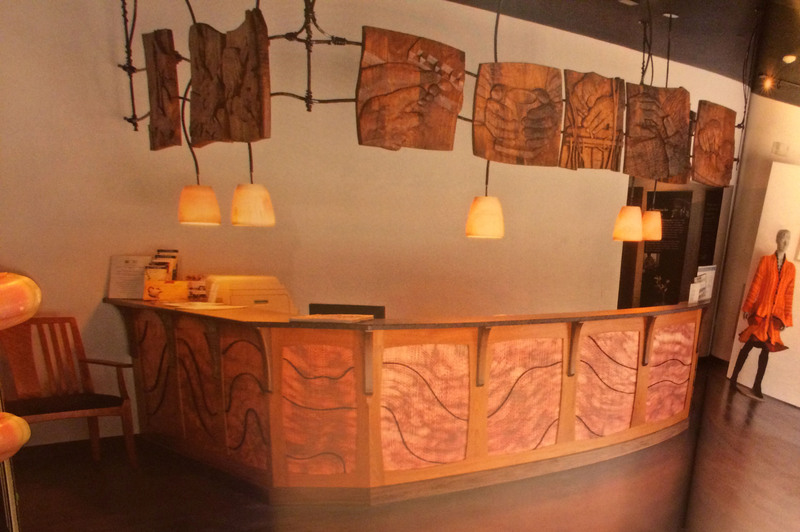 The gallery space is helmed by an amazing sculptural reception desk shown below. This project, called “Handcrafting our Headquarters,” was completed lovingly by six New Hampshire craftsmen who consider the work a collaboration in its highest form. Of particular interest to enamelists, nested inside carved wooden frames around the base of the desk are panels of copper. 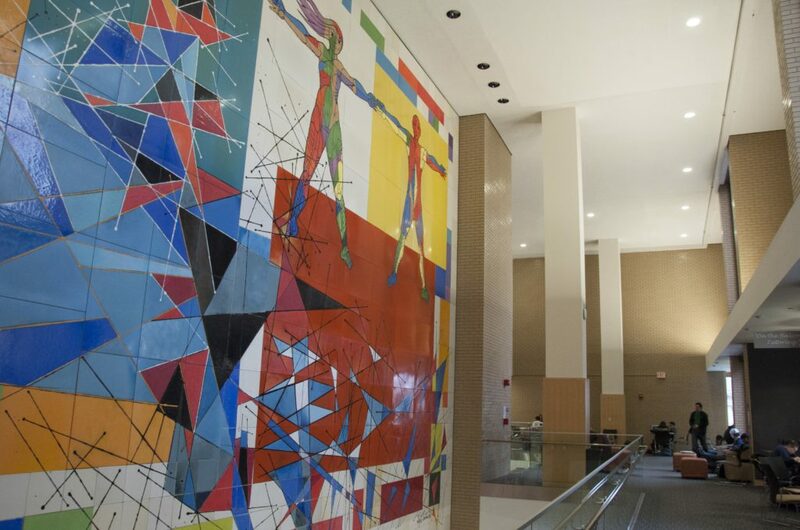 The panels were crafted by Steven Hayden, who applied several thick layers of specially formulated enamels, creating lines and producing a raised texture. He then used torch firing, with careful adjustment of the oxygen in the flame, to create a subtle array of colors from the finely ground copper oxide suspended within the enamel. There are many considerations that go into the selection of a venue to show our enamels. 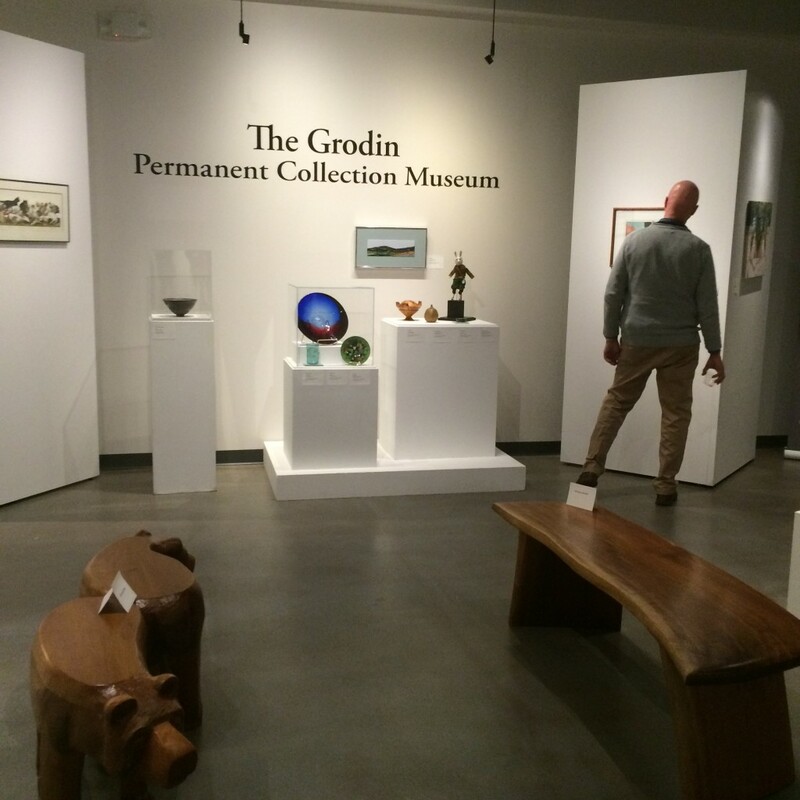 The welcoming, impressive aesthetics of the League of New Hampshire Craftsmen make their gallery a superb choice. The exhibition continues until March 18, 2016, and I heartily recommend a visit.